Cary Grant and Eva Marie Saint in Hitchcock’s North By Northwest. Not to get all gooey. But amid all the superficial crap and anti-hero emphasis on prime-time television, it’s sometimes both relaxing and reassuring to spend a little time with a viewer friendly network that knows how to treat a still glowing vintage Hollywood star. Eva Marie Saint, preparing to turn 90 on the Fourth of July, has outlived an incredible array of her former big-screen co-stars, including Marlon Brando, Cary Grant, Paul Newman, Montgomery Clift, Bob Hope, Gregory Peck and Frank Sinatra. 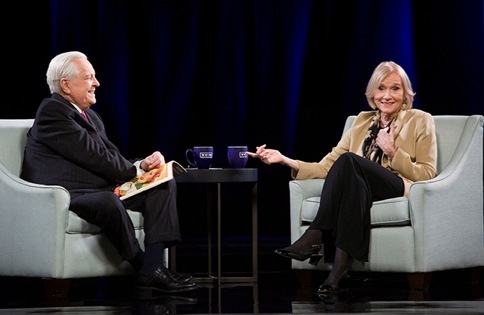 The one-hour Eva Marie Saint: Live from the TCM Classic Film Festival (Monday, March 31st at 7 p.m. central on Turner Classic Movies) finds her onstage with the always amiable Robert Osborne, who’s become the face of TCM as it celebrates its 20th anniversary. Osborne is no Grand Inquisitor, but he does ask pertinent, knowledgeable questions. And their stroll down her memory lane is illustrated with a very well-chosen collection of still photographs and clips from the likes of On The Waterfront, North by Northwest, Raintree County and Exodus. There’s even a scene from the 1949 TV production of June Moon, which co-starred Jack Lemmon. Saint won her only Oscar for her very first film, 1954’s classic On the Waterfront with Brando. It also was her only nomination. She’s shown accepting the award after presenter Sinatra invokes her name. “I may have the baby right here,” she said at the time. Two days later, Saint had her first child. She’s been married to TV director/producer Jeffrey Hayden (The Donna Reed Show) since 1951. He’s shown beaming from an audience of admirers at the venerable Hollywood Roosevelt Hotel, where this special was taped last year. Saint’s parents seemingly were heaven-sent. Their only shared vice was a three packs a day cigarette regimen, she recalls. But Saint survived all that secondary smoke while thriving on her parents’ support. She remembers the day she fell in love with acting while appearing in a school play. When she broke this news to her parents, her father replied, “Honey, whatever you want to do, just do your best.” Saint clasps Osborne’s hand and her voice breaks while she re-tells this little anecdote. On another occasion, Saint thought she had the only female role in a Broadway production of Mr. Roberts that co-starred Henry Fonda. But after previews, it was taken away from her and given to -- irony of ironies -- Brando’s sister, Jocelyn. On the subway ride back to her parents’ apartment in Queens, Saint remembers deciding to stick it out and remain with the play as an understudy (who in the end never got to perform onstage in Mr. Roberts). “When I got home, my mom had put a little silver star on my bedroom door . . . And I had to take the star down,” Saint recalls. But mom and dad remained firmly in her corner. Saint also remembers all of her leading men fondly. Still, some of the anecdotes are fascinating. Alfred Hitchcock, who directed North by Northwest, was primarily “interested in the external of the lady,” not the character’s inner feelings, Saint recalls. When he spotted her off-camera drinking coffee from a Styrofoam cup while still in costume, Hitchcock immediately demanded that a proper china cup and saucer be substituted. Saint primarily became a television actress later in her career, winning an Emmy for the 1990 miniseries People Like Us while also doing a guest shot on a two-part episode of The Love Boat. But her latest credit is for the feature film Winter’s Tale, which was released last month and co-stars Russell Crowe, Colin Farrell and Jennifer Connelly. It was largely panned. Not her fault. Monday’s special ends with Osborne telling Saint, “I hope you never change.” They end up kissing one another’s hands before he raises her right arm in triumph and calls her “The Champ.” In this case, that’s allowed. TCM is garnishing Eva Marie Saint: Live from the TCM Classic Film Festival with three of her most notable films. On The Waterfront follows at 8 p.m. (central) before a 10:30 p.m. repeat of the special. Viewers might then want to set their recording devices for Raintree County (11:30 p.m.) and North by Northwest (2:30 a.m. on Tuesday).